The MK 13 torpedo was the primary air-dropped torpedo of World War II and the first torpedo designed specifically for aircraft use. It was employed extensively by aircraft and patrol torpedo (PT) boats during World War II for anti-ship warfare. Initially flawed in its design, stabilizing modifications transformed the MK 13 into a successful, reliable weapon during the later years of the war. The idea that a torpedo could be launched from an airplane was first raised by Rear Admiral Bradley A. Fiske in 1911, but Naval development of an aerial torpedoes did not start until 1920 with the experimental air drops of two MK 7 Mod 5 torpedoes at the Naval Air Station in Anacostia, Maryland. The torpedoes were dropped at heights of 18 and 30 feet at a speed of 50–55 knots; the torpedo dropped from 30 feet was badly damaged. The following year an Aviation Unit was established at Newport’s Naval Torpedo Station (NTS) and extensive testing and modification of existing torpedoes for aircraft application began. Modifications were made to strengthen the MK 7 to withstand the impact of water entry and by 1924, MK 7 torpedoes were being successfully dropped from aircraft flying at speeds of 95 knots and altitudes of 32 feet. 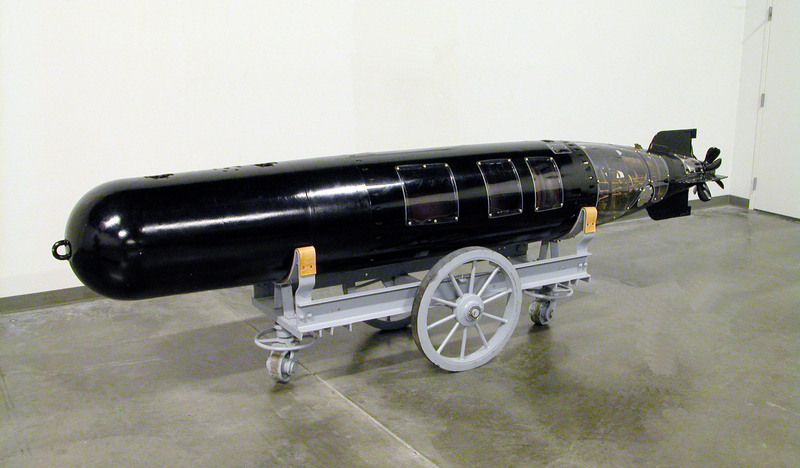 In 1925, the Bureau of Ordnance initiated Project G-6 to develop a torpedo specifically for aircraft launching; the project was discontinued the next year but revived in 1927 and modified in 1929. Specifications called for a torpedo with a range of 7,000 yards, a minimum speed of 30 knots, and the capability to launch at 100 knots from an altitude of 50 feet. The resulting torpedo was designated the MK 13 in August 1930 and performed successfully on its second test run in March 1932. More involved proofing began in 1935 and exceeded NTS’s expectations in trials from both test barges and aircraft. The MK 13 Mod 0 entered service in 1938 and was well received, but only 156 were produced before NTS decided to make alterations to its rail-type tail. Introduced into the fleet in 1940, the MK 13 Mod 1was unfortunately plagued with flaws, including a tendency to veer left, chronic depth failures, weak propellers that could not withstand the shock of water entry, and an exploder mechanism that sometimes armed in air. Engineers at NTS eventually developed a system of plywood stabilizers that individual patrol squadrons were responsible for constructing and applying. This proved to be an insufficient fix, however, and the poor performance of the MK 13 continued, culminating in the loss of 90% of the torpedo bombers that took part in the Battle of Midway. When NTS was unable to achieve the degree of improvement needed to make the MK 13 acceptable, the Navy turned to the National Defense Research Committee (NDRC) for help. The NDRC contracted with the California Institute of Technology (CalTech), whose scientists quickly discerned that a ring-type tail would improve its water entry stability. Toward this end, CalTech developed a low-drag shroud tail ring, as well as a “pickle barrel” drag ring that increased the stabilizing effects of the tail ring and acted as a shock absorber to reduce the impact of deceleration. A water trip valve designed to delay firing of the igniter until the torpedo entered the water was also added. The MK 13 Mods 2A, 3, 4, and 5 joined the fleet by the fall of 1944. With these critical improvements, the new MK 13 mods could be dropped at dramatically higher altitudes (2,400 feet versus 50 feet) and speeds (410 knots versus 110 knots). Naval aircraft received the new MK 13 torpedoes just in time for the Battle for Leyte Gulf, where they were used by TBF/TBM Avengers to help sink Japanese super battleships Yamato and Musashi. PT boats also used MK 13 torpedoes during World War II. During the early years of the war, PT boats carried the larger, heavier MK 8 torpedo, but in 1943 these units were replaced by the MK 13. Unlike the MK 8, which was typically fired from a torpedo tube, the MK 13 was launched from a MK 1 torpedo launching rack that rolled the torpedo off the side of the boat at a target. Replacing bulky torpedo tubes with the smaller, lightweight launching racks saved a great deal of space aboard PT boats and allowed them to carry a greater number of torpedoes.